When all else fails, talk up the future. 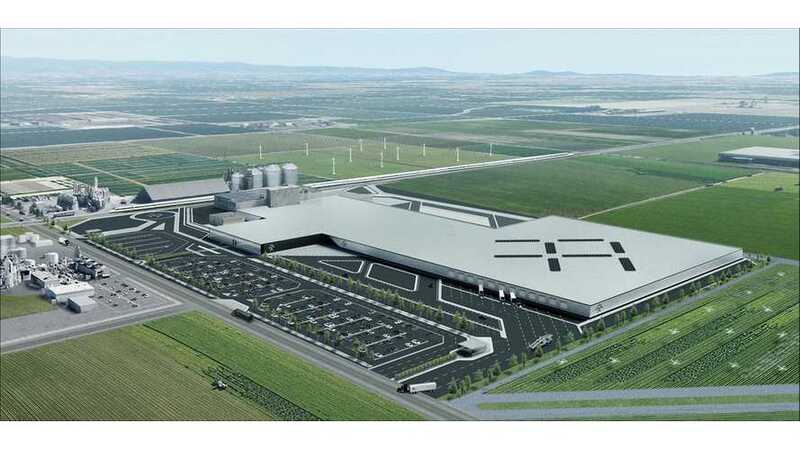 In this case, after making headlines because of the shut-down of construction plans for its Nevada factory, Faraday Future just released a rendering of a different manufacturing facility, this one in Hanford, California. The new facility used to make tires, when it was owned by Pirelli. The company says that this facility, "marks another significant step forward for the company in delivering its first production vehicle, FF 91, to market by the end of 2018." That prediction is, of course, still the subject of some controversy. The wealthy investor behind FF, Jia Yueting of LeEco, admitted recently that the money is getting tight. Faraday has said that Yueting's money woes won't affect its plans to build its first car, and this latest announcement includes a statement from Dag Reckhorn, Faraday Future's vice president of global manufacturing, who is apparently the leader of getting the Hanford site up and running: "Our new production facility is the latest demonstration of our commitment to getting FF 91 on the road by the end of 2018. Despite significant head winds on the path ahead of us, we are laser-focused on that one key milestone." Faraday Future seems to be getting more serious about its vision. The new leadership has deep industry expertise and the company is focusing on the FF 91 model. Now, Faraday has admitted its Nevada site was a mistake and secured a facility that will be more cost-effective and allow better speed to market. Given the rapid industry advances in electric vehicles, these are critical aspects for success. Faraday still has an uphill road given that producing a vehicle is a daunting task, and other electric vehicles are dominating the headlines, but at the very least, there is now some potential in a situation that was starting to look bleak. An uphill battle, perhaps, but at least Faraday has some recent experience with that. LOS ANGELES, August 07, 2017 –Faraday Future (FF) has signed a lease on its new manufacturing facility, and began the process of clean-up to prepare the new site for the move-in of manufacturing equipment. The facility marks another significant step forward for the company in delivering its first production vehicle, FF 91, to market by the end of 2018. Faraday Future had recently announced that it was shifting its manufacturing focus to a turn-key facility that offers a faster path to production. The new production facility, located in Hanford, CA, is strategically located between the country's two largest EV markets, Los Angeles and Silicon Valley. "We know there is a lot of work and risks ahead, but this event represents a major step forward for the company," said Stefan Krause, COO/CFO, Faraday Future. "Investors invest in people, and our employees continue to be Faraday Future's strongest asset. As we begin this next phase in our company's history, our efforts to build out strong corporate leadership will bring a new focus to Faraday Future and deliver on our commitments to employees, investors, suppliers, and future users, who have shown exceptional patience and resilience through the company's difficult times." On August 5, more than 300 Faraday Future employees and supporters voluntarily drove from Los Angeles to Hanford to begin the process of site clean-up, and embrace the company's new manufacturing home. State of California, and City of Hanford and Kings County officials were also on-site to welcome Faraday Future to its new production facility. "The future of zero emission production is in California," added Panorea Avdis, Director of the Governor's Office of Business and Economic Development. "Faraday Future's announcement today is another step towards realizing Governor Brown's goal of adding one and a half million zero emission vehicles on the road by the year 2025. When Faraday Future achieves its goals, the State of California achieves ours, and our office will continue to assist the company's needs to grow and expand, as we have from day one." Dag Reckhorn, Faraday Future's VP of Global Manufacturing is spearheading all strategy and execution behind the new Hanford site. "Our new production facility is the latest demonstration of our commitment to getting FF 91 on the road by the end of 2018," said Reckhorn. "Despite significant head winds on the path ahead of us, we are laser-focused on that one key milestone." Under Faraday Future's new leadership team, helmed by Krause (former CFO and board member of Deutsche Bank and BMW Global CFO) and Ulrich Kranz (former Sr. Vice President at BMW, responsible for the successful launch of i8, i3, Z3, and X5) in their roles as COO/CFO and CTO, respectively, the company is driving strategic changes to get Faraday Future investible. This new production facility establishes the best path forward for the company's manufacturing plans, and focuses on building out the company's network of investors to diversify FF's funding strategy. After Saturday's event, Faraday Future will continue the process of site preparations, including planning, refurbishment, and permitting. Following the move-out of current tenants in late November, the company expects significant movement to ramp-up on site in early 2018. Faraday Future's new manufacturing facility is 1M sq. ft., and will employ up to 1,300 workers, over 3 shifts, over time.